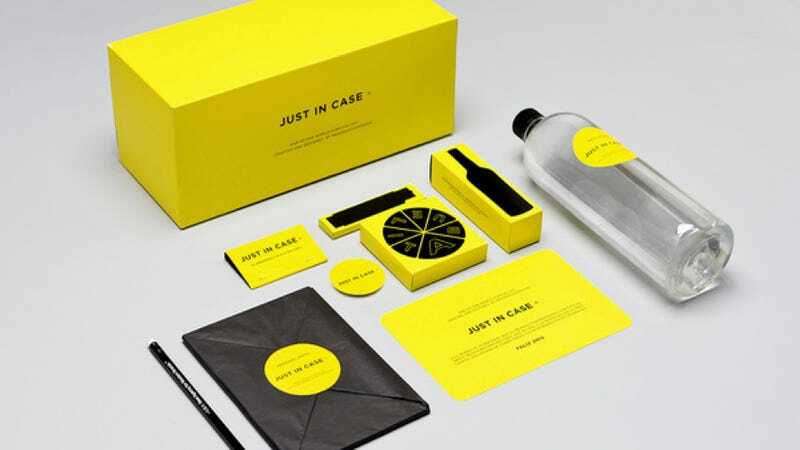 Mexican branding firm Menosunocerouno shows off its eschatological advertising with this elegant little "survival gift kit" celebrating the end of the world in 2012. If the world ends this year, we better be happily ready. Expecting a beautiful chaos, MENOSUNOCEROUNO created JUST IN CASE, the perfect brand for the end of times. A brand that covers all your basic apocalyptic needs. Our survival kit re-packages a collection of iconic products from Mexico to enjoy in no particular order . . .
01 - Chocolate Abuelita: Dark chocolate laced with cinnamon and covered in sugar. With more than 70 years in the market, this classic delight will make you feel well under any circumstances. 02 - Doméstica Yellow Notebook: A design classic from Monterrey. Tell the story, write like John, draw like el Bosco, or use it to start a fire. 03 - Simple Knife: Clean affordable design, a minimal hunting tool for animals or zombies. 04 - 40 Emergency Black Matches: Start a fire, get warm, light your way with style. Black is beautiful. 04 - Xtabentun D'aristi: Original Mayan liqueur from Casa D'aristi in Yucatan, one of our favorite brands of 2011. Celebrate like the old times! 05 - Basic Water: Drink wisely, survive up to ten days with one liter. I think they forgot the mini chainsaw.